Biolan decided to build a new wastewater treatment plant in 2004. The treatment plant should have sufficient capacity, also taking the future into account. The requirements were to achieve a good purification result as well as removing odours from the region. The plant was designed by the company Jaakko Pöyry Ltd. The size of the main process basin turned out to be 60,000m3, where the water retained for eight months. Using the first selected aerator, insufficient mixing was achieved for this, so Biolan chose the Waterix aerator that simultanously works as a mixer. Biolan ordered seven Waterix AIRIT® 70 aerators. The same aeration requirement could have also been managed with three larger aerators. The smaller devices were selected in order to ensure that aeration would occur as comprehensively as possible throughout the large basin. The aerators were equipped with their own floats and three-metre long suction pipes that increased basin circulation. Installation was carried out during a single day in June 2004. It was possible to start the wastewater treatment facility immediately after installation. In spring 2005, Biolan commissioned some extra capacity. This was performed by increasing the output of the aerators. The new capacity was achieved using seven modified AIRIT® 70 aerators. The capacity achieved was 20 kilos of oxygen an hour. The device investments for the sewage treatment plant were realised very affordably using seven AIRIT® 70 devices. 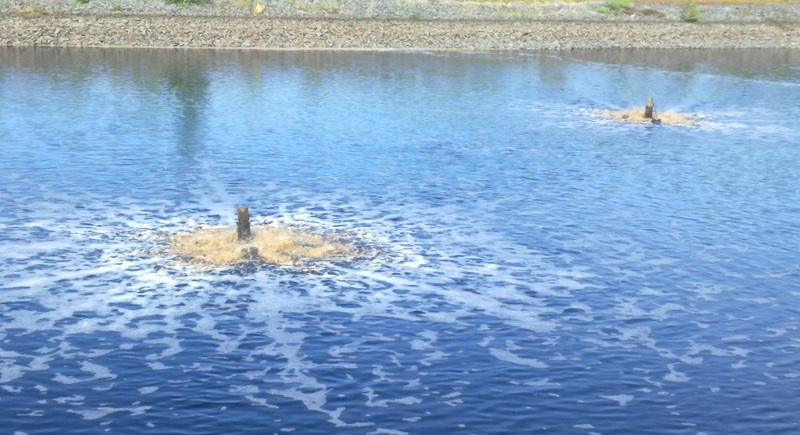 Using the floating aerators, the circulation and mixing of wastewater succeeded excellently, even though the water level fluctuates up to six metres a year. The Waterix Ltd solution received special praise for its easy installation and simple structure that only requires feeding an electricity cable to the device.